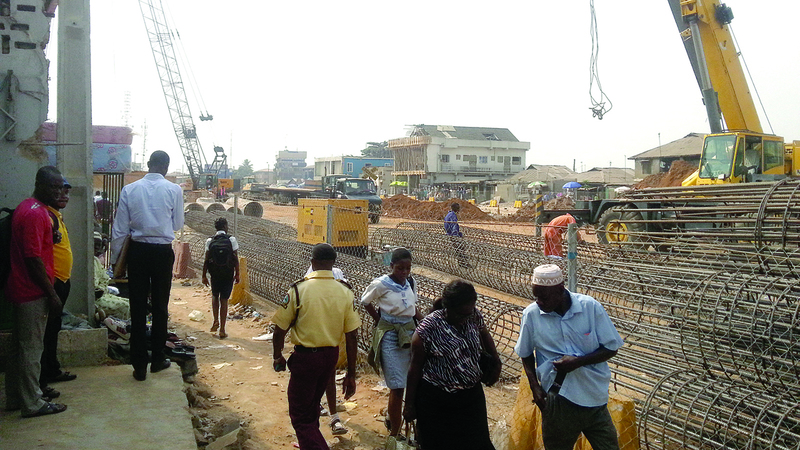 As part of efforts to enhance the free flow of traffic along the Agege axis on Lagos Mainland, the construction of a flyover at the Pen Cinema junction in Agege recently commenced. The flyover bridge, which will be constructed from Oba Ogunji through Ijaiye Road to Agunbiade, will be 700 metres long with improvements that will makes life easier for transporters. However, while the construction is on-going at the Pen Cinema end, residents and transporters have been groaning about the heavy gridlock in the area which has made life unbearable for them, as they have to look for alternative routes to get to their destinations. The mother of all traffic jams took place in the area and its environs penultimate Sunday when the busy railway crossing at Agege was closed to the traffic and many vehicle owners had to look for alternative routes. Hence the logjam that saw many people spent over three or four hours in the chaotic traffic to get to their destinations. A tricycle driver, Mr Musa Adewole, explained the challenges motorists go through as a result of the construction. “Though some of us used to ply one way, but as for me I don’t like plying one-way so I have to endure and spend one hour or two in the traffic congestion. Mr Saheed Kunle, a commercial driver who plies Pen Cinema to Mowe Ibafo Road, told The Guardian that the construction of the road doesn’t really affect them much because they have created alternatives for themselves to navigate through to get to their destinations. “Though we normally experience traffic, but it has reduced recently and at times we find our way round it. As a result of this, business is not moving like before, passengers don’t come to the motor-park like before because of the ongoing constructing due to the fact that the road they are supposed to pass through to get there has been blocked. We are coping, though, because we believe that when the work is completed, things will change and get better for us,” he said. He pleaded to the Governor Akinwunmi Ambode to enjoin the contractors in charge to hasten up with the construction, so that business can move smoothly and better for them. Mrs Grace, a trader who sells eggs, said market no longer moves like before because the authorities have chased them away from displaying their goods on the roads because of the construction. He noted: “We are here 24 hours and do a lot of public enlightenment, awareness and others, direct people who get here and are confused on the road, because the bridge they are constructing here is leading to other end of the road. It is a 25km long flyover and is going to beautify the place. However, traffic is going on smoothly but the bad thing is that if we don’t direct people, they are going to miss the way. We have two zones here in charge of that Zone 6, and Zone 29. Zone 6 is in charge of Agege, while Zone 29 starts from Oko Oba axis. Another LASTMA personnel, Daboh Akinola, also revealed to The Guardian that a number of things have been put in place to ease the heavy traffic as a result of the ongoing construction. He said the Odejobi Road that was initially closed down due to dilapidation has been fixed and opened as an alternative route for commuters early last week. “Odejobi Road is the road that connects old Abeokuta Road, Iju Road, and links to Abule-Egba, and it has been closed down for a while due to construction but was opened on Monday this week, and the heavy traffic issue as a result of the flyover construction is now rectified. “With this alternative road, the traffic is now controllable during the peak periods, and Pen Cinema to Fagba that used to be traffic logged is now free. “Also, more officials have been deployed and we are working hand in hand with other traffic control agencies. “Cones have been positioned to demarcate the lanes to avoid obstruction” he said. Mr. Ogundaisi Oladunni, a resident, said despite the positive ideology behind the flyover construction, the consequences of the development is tough on landlords, shop owners and residents of the Pen Cinema environs due to the demolitions tagged to the flyover project. “Shops and homes have been demolished and more demolition is anticipated and feared. “So people are not really happy but they cannot do anything about it since it is a state development” he said. Salami Olabowale, a commercial bus (danfo) driver said the traffic on the Agege axis has been severe until recently when Odejobi road was opened as an alternative route. “Odejobi Road has been shut down for a while for repairs, but since they opened it this week, it has been a relief route. “Though traffic still piles up in the morning and evening but there is no stucking on the road because of the alternative route, the LASTMA directives control it just fine” he said. Also, a safety officer on the construction site, who felt reluctant to speak with the newsmen, said work has started on the construction and their duty is to ensure the safety of workers and residents within the axis, thereby creating a barricade fence ensuring that nobody is allowed to go inside the site where they barricaded without their safety kits such as hard hats, eye googles, safety boots and gloves. He said the work has been going on smoothly and they’ve not experienced any form of casualty since the work commenced.